The Hawai'i Scientific Drilling Project (HSDP) has completed its first phase of core drilling into the Mauna Kea Volcano at a depth of 3,109 m in September 1999. These are the deepest core samples obtained from any Hawai'ian volcano and the suite of rock samples recovered may be the longest continuous stratigraphic record from any ocean island volcano. 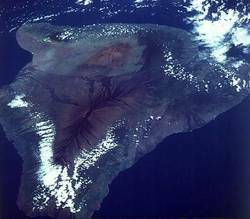 The primary scientific objective of the HSDP is to gain a better understanding of the geochemical and geophysical processes within mantle plumes forming "midplate" volcanoes such as Hawai'i, the Galapagos, and the Yellowstone volcanic system.